Du kan også lese dette innlegget på norsk. Gustav is now 1,5 years old (! ), and the bear-shaped baby mobile is still floating over his bed. Even though he’s mostly interested in putting on a show during bedtime, there are times when the thee flying bears are being studied like they were new. If you should be interested to make one yourself, keep reading for the tutorial and download the template (PDF) here. You’ll find more pictures of the baby mobile in this post. 1 – Print the template in A4. Make sure you don’t change the scale when you print. 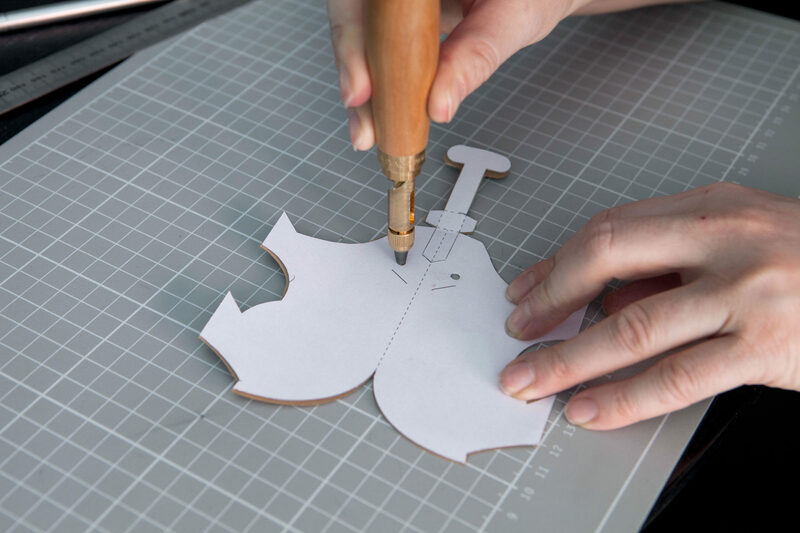 2 – Cut out the template by following the solid lines. Use the screw punch to punch out the eyes. 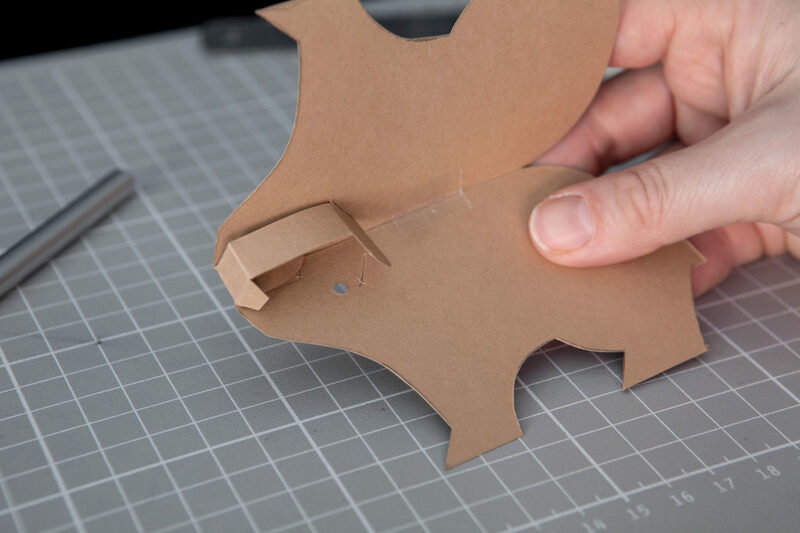 3 – Place the template on top of the colored paper so the bottom of two of the bear’s paws aligns with the edge of the paper. 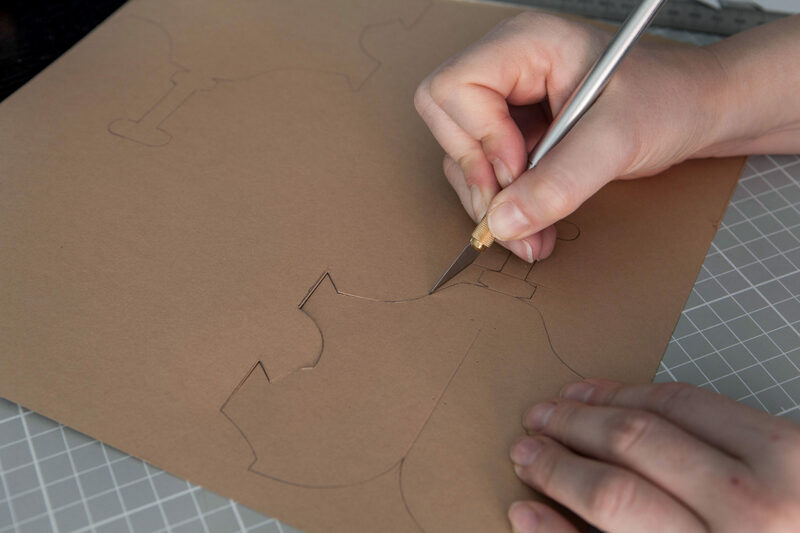 Transfer the template to the paper by drawing around it with a pencil. This will become the inside of the bear. 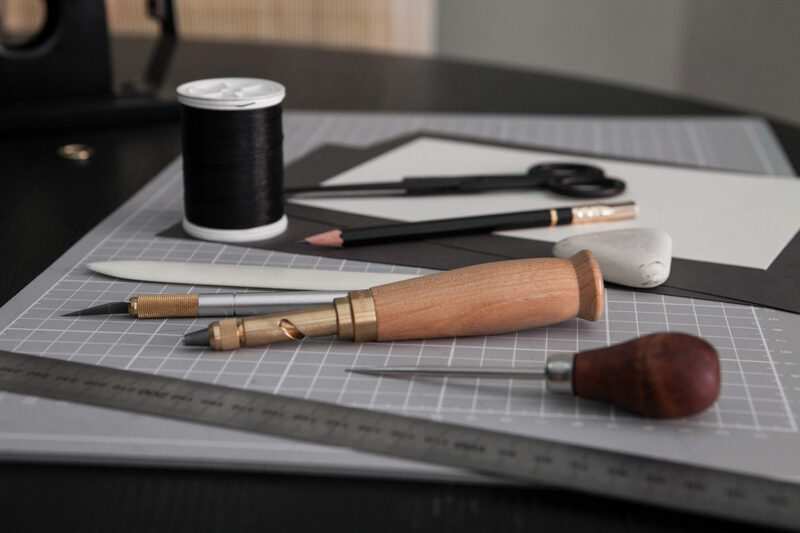 4 – Use an awl or a sharp needle to mark the beginnings and the ends of the short diagonal lines. Also, make a mark as an extension of the longest dotted line in the same manner. 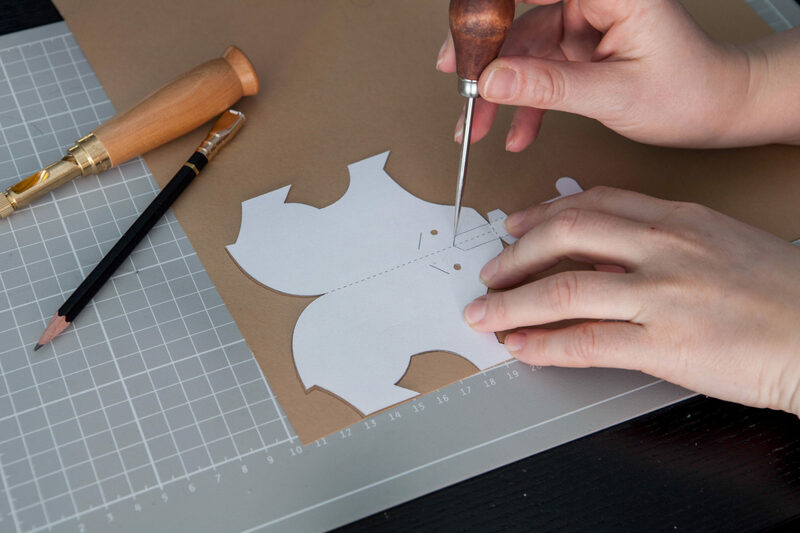 These marks will be used as a guide when cutting and folding in the following steps. 5 – Remove the template and use the small marks you made in the previous step as a guide to score all the lines marked as dotted in the template — except the red one. This will be folded in the opposite direction as the rest, and will be scored later. 6 – Place a small strip of tape over the longest dotted line were the two small dots are marked in the template. This is to enhance the area where the bear will be attached to the thread. 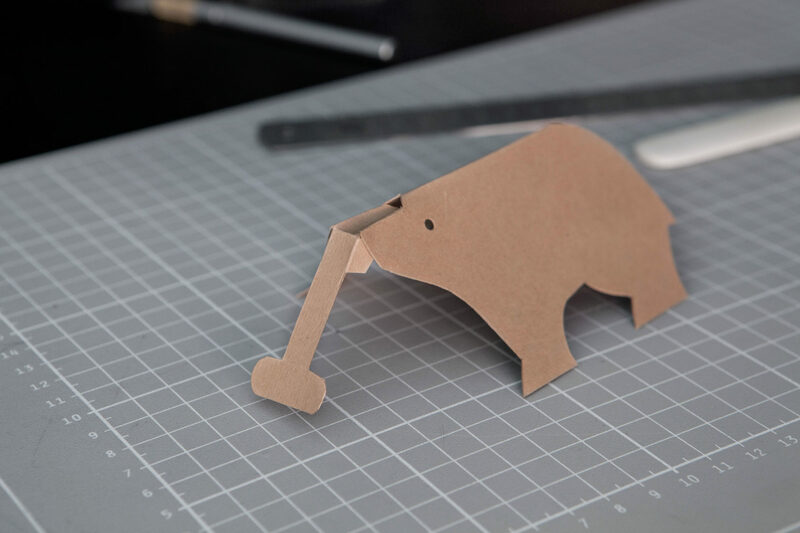 7 – Cut out the bear shape. Also, cut the four diagonal lines you marked in step 4. Leave the eyes intact for now. 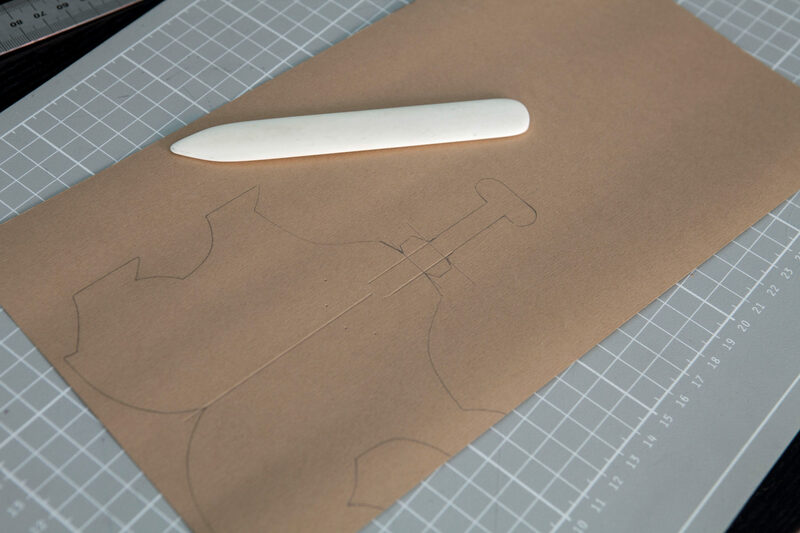 9 – Still with the template on top, make a mark at the start and end of the red dotted line using an awl. Remove the template, and score a line between the marks. 11 — Fold all the scored lines. 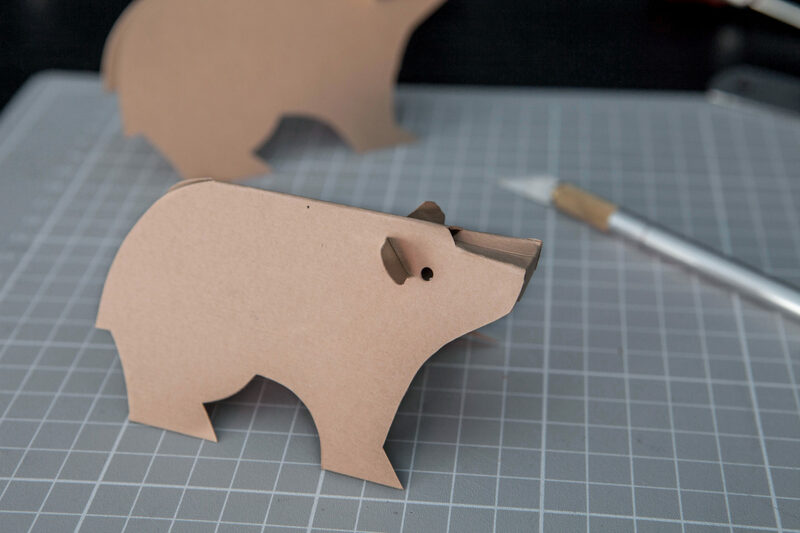 12 – Thread the ears through the diagonal lines on each side of the bears head from the inside. If you thread both halfway through first, it will make the process easier. 13 – Add a small amount of paper glue on the two areas marked in gray in the template. If you’re using RX glue, you need to let it dry for a minute before you glue the flaps to the inside of the bear’s nose. 14 – Repeat the process two times so you have three bears. 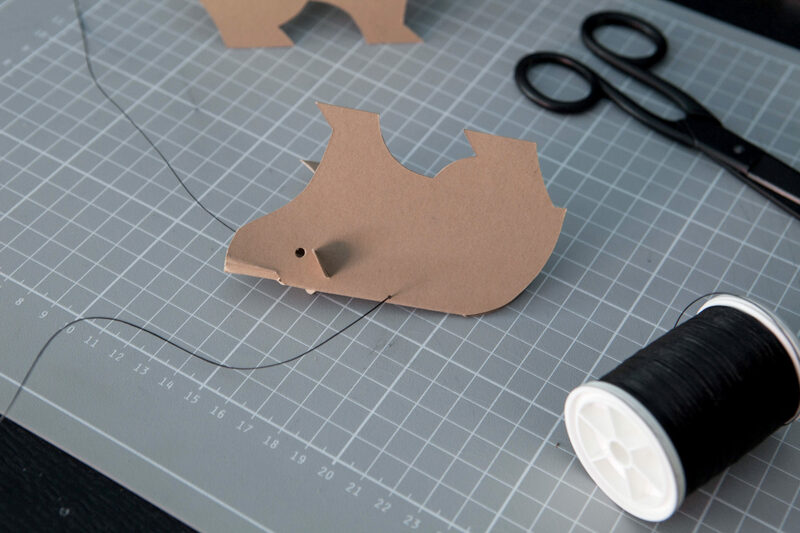 15 – Attach a thread to each bear by threading it through the holes you made in step 8. Thread again and make a solid but subtle knot. 16 – Decide on a distance between the bears and the metal ring, and tie the thread to the ring. 17 – Collect the three threads and hold the mobile up so that it’s parallel to the floor. Tie the threads together, and then to the small ring to connect to a hook in the ceiling. Then all that’s left is to hang the mobile securely over the baby’s bed, making sure it can’t fall down on the baby, or that it can’t be reached by the little one. Feel free to comment if you have any questions.